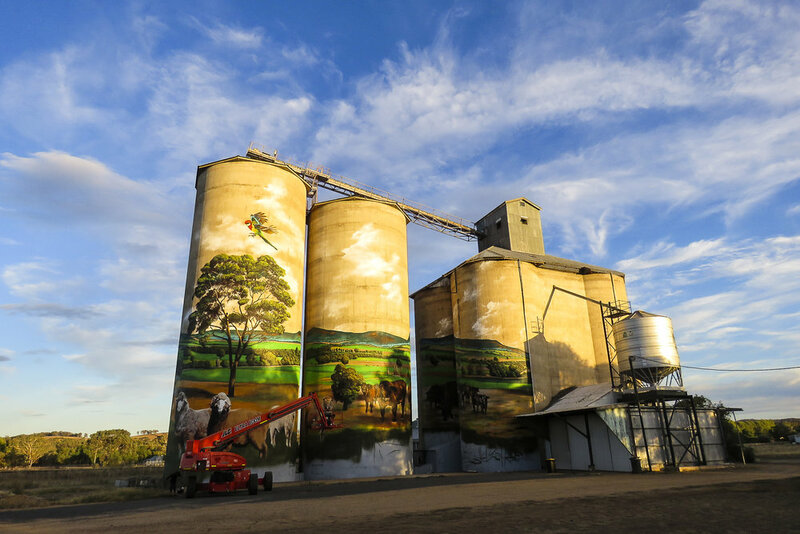 The Australian Silo Art Trail was conceived in 2015 in the Western Australian town of Northam through a creative collaboration between leading cultural organisation, FORM, and CBH, the grain grower cooperative group. The creative trend travelled interstate to Victoria when the town of Wimmera-Mallee launched six evocative pieces of public art on silos. The positive community response inspired many towns Australia-wide to adopt the public art initiative. The Australian Silo Art Trail has since grown extensively and enables a unique opportunity to connect regional communities through art. The artworks in each community are symbolic and no two artworks are the same. The artists and designers consult with the local communities to understand the local people would like incorporated in the designs. The participating artists integrate the insights from the consultations into their art features and they take great care to remain respectful and reflective of the local communities and environments they work within. The latest artwork, number 26 in the Australian Silo Art Trail, has been completed in the town of Grenfell in Central West New South Wales. The grain silos in Grenfell, located on the edge of town, have been completely transformed by Melbourne based artist Heesco Khosnaran. Peter and Shirley Mawhinney, Trevor Mawhinney and Glenn Beasley, the owners of Grenfell Commodities, privately commissioned Heesco to undertake the transformation. The project was a collaboration between Heesco, Belinda Mawhinney (Peter and Shirley’s daughter) and Denise Yates, a local photographer, from Five Hours West. Heesco was tasked to create an artwork that was ‘iconic to the shire, but that didn’t feature people’. Denise supplied photographs of Weddin Mountains, farmland, cropped paddocks of canola, livestock and native birds that Belinda designed into a montage to form the basis of the artwork. Heesco’s first silo artwork project was undertaken in 2018 in Weethalle, New South Wales. The Grenfell silo transformation, the largest of the two projects, took Heesco five weeks to complete due to the intricate detail in the design. Heesco used 800 cans of spray paint and 130 litres of acrylic paint to transform the silos and the project was completed on March 21. A story board will be installed at the silos, so visitors can learn about the process and history of the silos. The Grenfell Silo transformation was a private venture undertaken by the owners who would like to thank Heesco, Haymes Paints, Coates Hire and the Railway Hotel for supporting and partnering on the project.